Saving Amphibians, One Chopstick at a Time. The motto for the conservation program for Chopsticks for Salamanders is BYOC: Bring Your Own Chopsticks! What do have chopsticks and salamanders have in common? Not much, but the elimination of disposable chopsticks can help save salamanders from going extinct around the world. That is why National Zoo Reptile Discovery Center keeper, Lauren Augustine, has started the Chopsticks for Salamanders initiative with the aim of saving the dwindling habitat of these fascinating creatures. Salamanders have always been a passion for Augustine, but when she learned of the extensive deforestation of their habitat, she decided she needed to take action. Though chopsticks may not seem like a common utensil in American culture, their production is one of the leading causes of international deforestation and loss of critical amphibian habitat. Nearly one-third of the world’s amphibian species have been classified as threatened near extinction due, in part, to increasing run-off, rising ground temperatures, the disruption of vernal pools and other issues associated with deforestation. To stop the loss of critical amphibian habitat, the American Association of Zoo Keepers (AAZK) has chosen the salamander as the flagship species for their initiative against deforestation. By using re-usable chopsticks, consumers take a stand for forest stewardship. Disposable chopsticks are typically made from old-growth forests that are clear cut in search for the perfect straight-grained wood used for chopsticks. A total of 3.8 million trees are produced annually in China for chopsticks. With recent tax hikes on Chinese chopsticks, the United States is now being targeted to become more open to disposable chopstick manufacturing. Historically, deforestation for chopstick production occurred in Canada, Minnesota and New Mexico. Today a company in Georgia is meeting this demand and business is doing so well, they’re considering expanding to other states such as Florida, Alabama, Mississippi, Virginia, West Virginia, Michigan and Oregon. With the demand for chopsticks escalating in Asia, the old growth forests in the Appalachian Mountain region could be targeted for deforestation, according to Augustine. The situation is critical for the 14 percent of the world’s salamander species and other wildlife that live in the region. That is where the Chopsticks for Salamanders initiative comes in. Through the sale of reusable branded chopsticks and the distribution of information cards at AAZK chapter events, Augustine hopes to promote forest stewardship among the public and raise money for salamander education, conservation and research. Three founding AAZK chapters (Greater Baltimore chapter, Bronx Zoo and National Zoo) have committed to helping disseminate information and sell chopsticks. So far, the initiative has raised more than $3,300 through the sale of chopsticks and donations, with $1,500 of those profits going directly to salamander research and conservation. With plans to expand to other AAZK chapters, the project can make a significant impact for salamander and forest conservation. 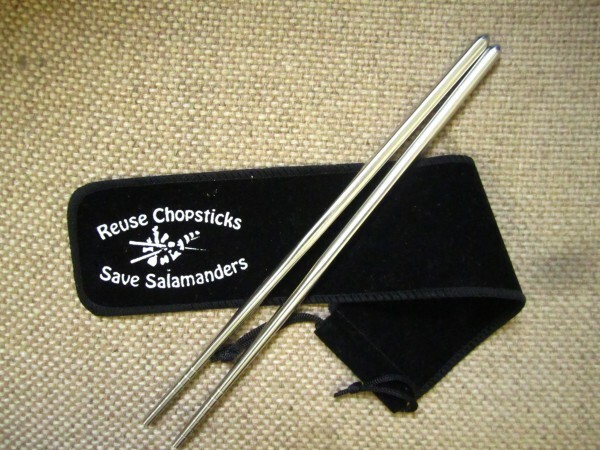 For more information on this project and how to purchase re-usable chopsticks, please go to www.chopsticksforsalamanders.org. This entry was posted in biodiversity and tagged Chopsticks for Salamanders by Lindsay. Bookmark the permalink.